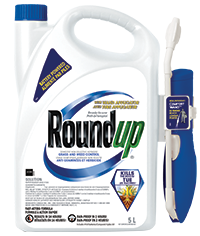 Roundup® Ready to Use with Wand Applicator, a non selective grass and weed killer, controls most annual and perennial grasses, including lawn grasses, broadleaf weeds and brush (i.e. virtually anything that is green and growing). This product is absorbed by the leaves and moves throughout stem and roots to control the entire plant. visible symptoms of control such as browning or yellowing of leaves will occur within 1-2 days. Your coverage will vary based on the number of weeds treated and the size of the weeds in a given area. May be used around vegetable gardens. Also use on patios, walkways, driveways, gravel and mulch beds, around shrubs or trees, in flower beds, and along fences. To use remove applicator from side clip, unwrap hose completely, insert plug at end of hose into spout. Twist spout to ON. Flip open applicator wand until it locks into position. Twist nozzle at end of applicator wand to desired spray pattern. Ensure trigger lock is disengaged before spraying. Hold trigger for continuous spray. Release trigger to stop spray. Apply when weeds are actively growing. Be sure to spray when the air is calm to prevent drift to desirable plants. The fast and easy way to kill weeds. All ornamental flowers, trees and shrubs may be planted one day after application.